Bag Lady Sue available for Corporate Events, clubs, fundraisers and parties. Suzanne Austin is a comedienne you will not forget. Her comedy is geared toward "Adult", dare we say "Mature" audiences. She has a hair trigger mind and a caustic wit that will destroy any preconcieved notion of what a female comedian should be talking about. Suzanne created a character named "Baglady Sue" who combines the physicality of Lucille Ball and Red Skelton with the finest traditions of Burlesque and Vaudeville. Then she placed this cranky old hag in the middle of large crowds of all kinds, across the country to howls of disbelief from the roughest biker to the outwardly conservative business man, and nodding approval from his wife, and/or mistress. The character is far from the real woman underneath! Suzanne is tough, attractive, intelligent and empowering. She is liberated, uninhibited, gutsy and up for interacting with you, whether you can take it or not. Suzanne Austin is 100% woman, she roars and her growl will have you on your knees with laughter. 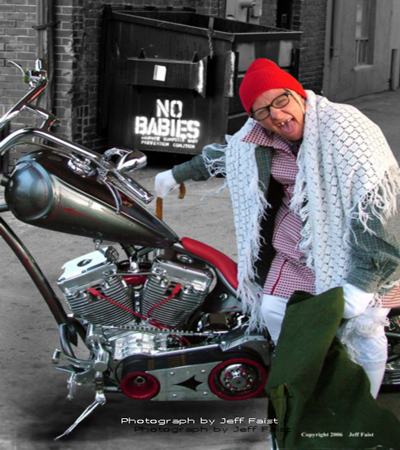 Suzanne is an established presence at Motorcycle Rallies from Alaska to Sturgis and Vegas to Daytona as well as comedy clubs, corporate events, and many other large public, and private venues, all across the nation! Suzanne Austin is a voice with a message that inspires women to remember they have power and reminds men to respect who they want to sleep with tonight or that they could be sleeping alone!